Five new manuscripts containing whole or partial Sentences commentaries have been added to the SCTA image viewer from various libraries throughout Switzerland. Thanks to IIIF and the open-access philosophy of the e-codices project, new codices have been seamlessly added to the viewer. Right now we are using the e-codices manifests, but eventually I will create custom manifests in order to isolate only the sections of the codices that contain Sentences commentaries. Likewise, these custom manifests will connect these images to the SCTA archive, providing additional information like table of contents and various annotations layers. For now, however, just adding the boiler plate manifests allows us to create exciting new comparisons. 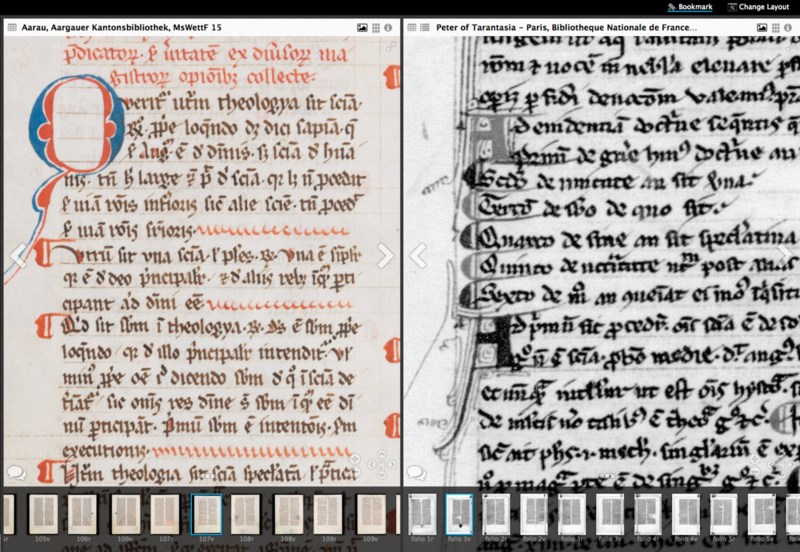 For example, now we can compare a section of the abbreviatio of William Rothwell in the Kantonsbibliothek (Aarau, Aargauer Kantonsbibliothek, MsWettF 15) with the parent commentary of Peter of Tarantasia in the BnF (Peter of Tarantasia - Paris, Bibliotheque Nationale de France, ms. lat. 14556). On my count, there are now 36 codices in the SCTA image viewer!